Like all moms, for Mary her Sophia was the apple of her eye and her heart. Haunted by strange curses from her orphanage days, Mary never knew the story of her dark past until the day she received that strange, mysterious letter. Never in her wildest dreams did she fear that fate would wipe away the peaceful serenity of her life. The sweetest songs are those that tell of broken hearts. Wallpapers, Sound tracks, Replayable Mini Games and more! 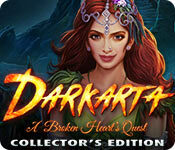 Darkarta: A Broken Heart's Quest Collector's Edition is rated 4.6 out of 5 by 80. Rated 5 out of 5 by gndsimons from Picky, Picky, Picky I bought the CE of Darkarta: A Broken Heart primarily because of the reviews – nearly 80% giving it a “5”, with no one (at this time) giving it a “1”, and with 95% of the reviewers recommending this game. I seldom buy a CE, because I find the SE almost always gives me a better value (I don’t feel a need for most of the extras included in the CE versions). I am content with this CE purchase because I look forward to the bonus game, the morphing objects, etc. I was curious about some of the lower reviews (“2”), however, and found that for the most part those reviewers were being “picky” about what they personally disliked, and that’s okay, we all have our likes and dislikes. For me, I want a game that is VERY ENJOYABLE TO PLAY from beginning to end. It doesn’t matter if the animation is not top quality, the puzzles are too easy or too hard, whether it has helpers or not, whether the storyline makes perfect sense all the time, etc. Keep in mind the developers are trying to make a game that appeals to many users – novice and expert, young and old, curmudgeons and non-confrontational, male and female – how difficult a job is THAT? I found this game to be VERY ENJOYABLE despite not liking everything about it. I really found the puzzles were imaginative and different from the run-of-the-mill games we see so often. However, there was a place in the game where it wouldn’t save my progress, and I got an error statement several times. But once I followed the Strategy Guide EXACTLY (which I shouldn’t have had to do), I was able to progress to the end. I went to the Forum to see if others had this problem, but the Forum doesn't exist yet. Perfect? No, but definitely one of the better games in a real long time in my opinion. Try the demo first if you have any questions. Rated 5 out of 5 by CNew from Game Has a High Rating...I see why Although this review is submitted later...I wanted to contribute how much I enjoyed this game, as I tend to sort on latest reviews to display first. Like other reviewers have stated once I started the demo I was hooked and with the sale going on I couldn't pass it up. The puzzles and HOS are more challenging in a fun way. Also liked the visuals and interesting story line. Highly recommend this game. Rated 5 out of 5 by TheRealMagicJack from A Game to Play for Sure I know there are a ton of reviews already, but I just wanted to say how fun and refreshing this game is. There are so many hidden object games that are released, it's hard to get one that has unique qualities to it. This game is one. It's not a difficult game, even on expert mode, and I do like a challenge, however, the difference and originality of the puzzles and mini-games, combined with very colorful graphics and subtle ambient music, makes this game one of my highest recommended purchases ever. Rated 5 out of 5 by soulofplaice from Best HOG for a long time. Really, really enjoyed this game. I must admit to being a bit bored with the games recently, same old, same old. This one, however, seems fresh and original. Love the smattering of Hindu mythology. More of the same from Tuttifrutti, please. Rated 5 out of 5 by mamajay from Darkarta: love, envy, death, retribution, forgiveness - it's got the lot! I thoroughly enjoyed this game. Set in India, it's all about the sins of your (forgotten) past demanding vengeance, and what will you do (this time) to make things better? Voices, graphics, and music are excellent, and the story is well told. This is a game that will tug at your heart strings, and make you want to get on with the rescue, pronto :) I really liked the interaction between the mortals and immortals, and also that it isn't just us 'mere mortals' who can make mistakes, lol. I found the game to be quite a long one (at least it was for me), and the bonus chapter was a good length too.Set after the main game, it has no affect on the original story, but it does finish it off nicely. As always with these games, try the demo first, before deciding if it is a game you want to buy. Rated 5 out of 5 by lincslady from What a Great Game! What a refreshing change this game is. Yes the storyline is the usual, a member of a family looking for another, but in all of that this game has some new angles in the hidden object scenes. Fabulous graphics and the puzzles are different too! Never heard of tuttifrutti games before but will certainly look out for them. The length of the game is good value too. Lets have more games like this BF! Rated 5 out of 5 by fuzo from something wonderfully different Most enjoyable game, storyline very well done although taken from a comic and turned it into a game wonderful. Once you get into the game you want to go on to finish. Big Fish games please keep bringing more game with good storyline, design and art style is also pretty. Puzzles and HO are new and interesting not complicated but enjoyable. I play to enjoy. The guide takes you straight to the place where you are in the game no running around. Big Fish games I am your greatest fan. Rated 5 out of 5 by patchesandme from Wanting more games from Tuttifrutti ! I won't go into detail on anything since it seems others have covered it all. I also don't do reviews but had and needed to say this is the best game I have played in years! Think I own every HOPA since 2010. Yes it does have some pep pev's in it that I have but with this game none of them matter. Yes, it's that good! Rated 5 out of 5 by coolgirl17 from HATS WAS SO COOL i love the story a women received's a mysterious letter to come to an island so then they go. mary 's daughter get kidnap and her husband gets hurt so she is the only one to save her sweet child from something that happen in her after life which you get to know that .you did something very very cruel to two lovers .but you need to hurry sophia mary's daughter is ruing out of time .i like to say this was very cool of a storyline and love that the sory had .ps its a must to me. Rated 5 out of 5 by GoneFishing from An excellent game I really liked this game. Interesting to see a storyline structure rather common in indian stories being used successfully in a game. A variety of HO scenes and puzzles was a plus too. Some English language errors were the only negative points that I spotted but they didn't bother me too much. Rated 5 out of 5 by dianna925 from Definitely worth playing more than once! Now that I've finished the game, the only comments I have that may not have been mentioned before are that the Strategy Guide needs to be organized a bit better and I was unable to get a couple of the morphing objects & memories because the game moved on & locked the locations before I could click on them. Since I'm kind of slow like that, I love it when I can go back at the end & pick up those objects. Other than those minor 'problems', I think this might be one of the rare games that I will replay. For most games, once I finish, they just aren't interesting enough to replay especially just to find something I missed. This will be the exception. Love it! 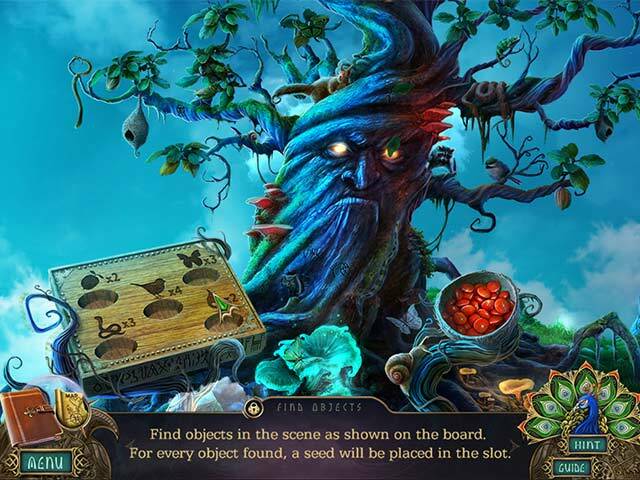 Rated 5 out of 5 by JEANNA617 from Great Strategy/Hidden Object Game I have been playing Big Fish Games since 2009 and this was a very pleasant change of pace! This game kept my interest from beginning to end, I enjoyed it very much and I would love to see more games like this one. Rated 5 out of 5 by Marja67 from Lovedit! Stuck with this one day and night to save the little girl. Pretty graphics and story. Awesome puzzles in between scenes. Rated 5 out of 5 by Rrthr from Finally the ever best game of the year is out! I never write reviews - there are quite a lot of of them already - but this case is different. I played the beta a very long time ago, literally fell in love with this game and waited one whole painful year for it to come. Although some might say it's about a mother trying to find her abducted child it has nothing to do with the eternal repetitive old stories that we see nowadays in every game. It's a tale from India with an enormous beauty both in its story and in its scenes. I rarely saw visual scenes as beautiful as these. I don't know how some say the game is cartoonish. It is so well crafted that some scenes look like works of jewelry. As for the gameplay, it's not that kind of game where everything is given to you straight and you don't even have to think. This one is well engineered, the minigames are intelligent, the hops with minigames inside and imaginative. So far, it's the best game I've played and I wish this developer would be able to issue more games. Rated 5 out of 5 by Amethyst37 from Bought it within minutes of playing demo When I saw this game & all of the positive reviews, I knew I had to give it a try and boy was I glad that I did. I love everything about this game; the graphics are beautiful, the music is stunning & fits with the story line & the games are different than in other that we've all played. This is a must buy game! I'm already waiting for more of their games to come out!! Rated 5 out of 5 by charlene_lane from BEAUTIFUL HEART WRENCHING LOVE STORY REVIEW OF COMPLETED GAME AND BONUS. Wow, what a game. This is the first time ever that I had a tear in my eye. If you love a great story line, then this is the game for you. In the main game you play Mary to rescue your daughter Sophia. 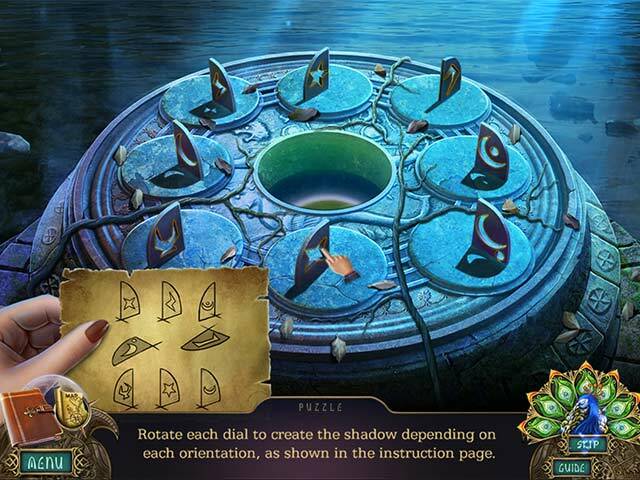 In the bonus game you play Shukra, the Grand Master of the Indus School of Magic. If you are thinking about waiting for the SE of this game, I would reconsider because the bonus is integral with the main game, so you won't get the whole story. There is: * Voiceovers (with dialogue); * Casual, Advanced, Expert and Custom modes of play; * Interactive map; * 35 Achievements in the Hall of Fame; * Fully integrated Journal; * Comic book love story; * Find 28 morphs and 30 memories (in main game only); * 32 replayable mini-games and 17 replaying HOPs. The graphics are gorgeous with plenty of colour and sharp well-defined scenes. I loved going through each scene, not knowing what to expect next. Sound is good and the music is orchestral and quite haunting. The mini-games are mainly straightforward, silhouette and putting items back. Some of these had quite a good challenge. However, if you get stuck trying to find that elusive item, then you can play Match-3 instead. There are a huge variety of mini-games to play and I loved every one of them. There are games in there for everyone - from puzzles to memory games, etc. I'm sure you will find your favourite ones in there. Throughout the main game there are 30 memories and 28 morphs to find. The morphs change from a snake to an eagle and morph quite slowly - around every 10 seconds I think. Once you see the eagle, then you can click on it - you just have to wait. A hand DOES NOT hover over the morph but they are not too hard to spot. The memories are Sophia's toys, etc which are easier to spot. If you miss any during the game or want to do them later, then you can do them at the end of the game. The interactive map tells you what morphs and memories are in each scene. There is a comic book love story which tells you the whole story about Anantha, Aneeha and Nagin - well worth reading. The game is really long which took me most of the week playing in the evenings. Its a complex heart wrenching story that will tug at your heart strings. Overall a terrific game and so worth buying. Well done to the developers. I am now a loyal fan and look forward to many more stories to come. Happy playing fishies - most definitely recommended. Rated 5 out of 5 by diamond_dust38 from Darkarta:A Broken Heart's Quest I played the preview of this game and found it to my liking I then bought the game. I just had to see how it was going to end. It is a good story and a lot of fun. Rated 5 out of 5 by fulana555 from Love the option to turn off award pop-ups Thank you for offering this! They are so annoying. Rated 5 out of 5 by saskatil from LOVE, REVENGE, SACRIFICE and REDEMPTION If you are looking for a game that delivers more than the usual story-lines, one that explores emotions, and challenges how you see 'right' and 'wrong', go no further than Darkarta. At first glance, its a simple tale of a mother's search for a lost daughter. As you progress through the game, you realise that actions have consequences that can echo through the generations. Sometimes it takes a powerful love to right old wrongs – will you be able to meet that challenge when it comes? I would suggest reading the 'comic' before playing the game, as it gives you the back story, and will explain the origin of Darkarta - the 'Dark Force' that is seeking to resurrect a lost love; and how the power of an unrequited love can unleash that dark force. The settings range from a lush and tropical Indian setting, to a stark and forbidding place where the end game is played out. (Followed by the extra scene set in the afterlife.) Like other players, I have been blown away by the creativity of this developer, and their adaption of an Indus culture and mythology to a gaming format. This hard-bitten gamer felt the raw emotion in a couple of places, and still does, even after several go-throughs. Try it. It's good. Rated 5 out of 5 by sabinepranjic from Interesting game andquite long it is a very good game and quite long. I'd like to play it and it would be nice to have more of this kind. Interesting mini games. Rated 5 out of 5 by Kay_Erin from Finally, Something Really New In HOGs! I know this already has a solid 5 rating but I must add my 2 cents;) This game presents another culture that I am, for the most part, ignorant of, and presented it in a very accessible manner. But the best thing about this game is the reinventing of how HOS work. Sometimes you cannot finish a hos in the box, but have to go Outside The Box to complete it! Not everything is as it seems. There were so many discoveries I can't remember them all; what I do remember is NEVER being bored or thinking I had to repeat the same old sequences I've done in other HOGs. 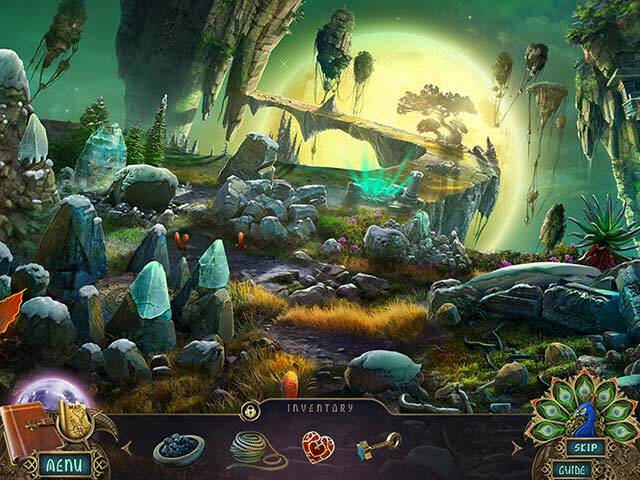 (Hidden Object Games) And the story is truly universal; about the love for a mother for her child. And it doesn't pull any punches, making the the mother or the child perfect. Don't necessarily expect high reviews from folks who like puzzles more than hops: this game is truly for HOG lovers. The puzzles it did have, for me, were solvable, which probably means they weren't as difficult as some would like. The art was painterly and filled with what looked to me like "Indian" art. (As I said, I'm no expert; wish players in India would chime in:) Get this game! If you are a HOG lover (that doesn't sound nice does it, but still...) you will love it! Rated 5 out of 5 by kentalope from New Game, New developer, a 5 STAR GEM A must try for all gamers. Beautiful art and graphics, great story line, all the fun and extras I enjoy in CE games. Hope to see more from this developer soon!!! Rated 5 out of 5 by Pandashie from LUVVIT! Finished the trial in no time! Looking forward to buying it and finishing the whole game!! Enjoyed the graphics and gameplay. It is a true hidden-object/adventure! Rated 5 out of 5 by leapfrog0202 from Simply the best This game is head and shoulders above anything else I have played on this site. The graphics, story line and originality are the best I have ever experienced. Rated 5 out of 5 by LaTusita from So Beautiful One of the most visually stunning games I have ever played! While some of the tasks are similar to other games, I like the fact that, when you revisit a scene, there is a possibility of a collectible appearing that was not there previously. Interesting multi-layer mini-games that I am enjoying as well as the fact that the story is set in India for a nice change of locale. I hope this new developer has more games in the works. Enter the enchanted 'Netherworld' where your destiny was written in blood and which whispers of true love.